You are currently browsing the tag archive for the ‘Vertigo imprint’ tag. Gaiman and McKean make for a stellar team. One a master of dark, yet whimsical fantasy writing, the other an artist who introduced a post-modern, industrial aesthetic to the comic industry. During Gaiman’s seminal Sandman for DC’s mature reader’s Vertigo imprint McKean provided much of the amazing cover art and continued to do so for various spin-off titles that emerged afterward. He also interpreted the esoteric script for Grant Morrison’s Arkham Asylum: A Serious House on Serious Earth as a Jungian nightmare that elevated DC’s Batman mythos far above its pulp origins. The dynamic duo have moved on from comics to greener pastures, with McKean providing the credit sequence for Gaiman’s television series Neverwhere (as well as the cover for the tie-in novel). Later McKean took on directing, with his assured debut Mirrormask, scripted by Gaiman (of course) a hallucinatory vision of a rust-brown dream world, with winged gorillas, stone titans and dark queens waiting within. With this book the pair took their inspiration from Gaiman’s daughter’s complaint about his ‘crazy hair’. The story’s narrator explains to young Bonnie just how crazy his hair really is. Featuring pirates, a polar bear, exotic birds, butterflies and even stalking tigers, it is very crazy hair indeed. Eventually Bonnie attempts to groom the narrator, only to disturb a mysterious voice inside the hirsute jungle. She is suddenly seized and pulled into the world of hair and has many amazing adventures. Gaiman’s rhymes accompany McKean fantastic visuals throughout. 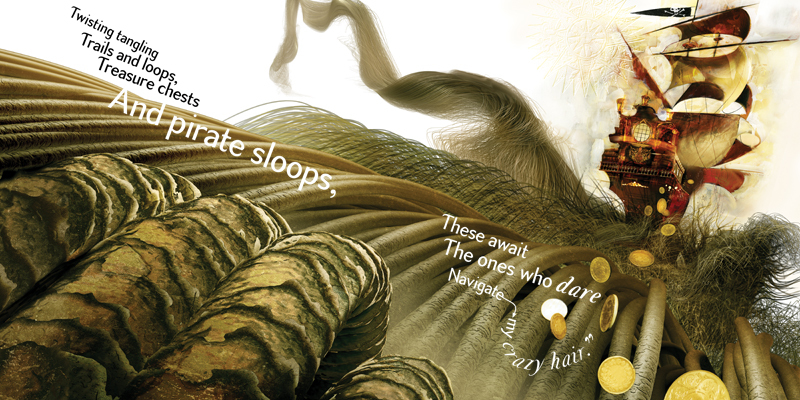 Giant, cracked follicle seas; tentacle-like strands stretching out from the narrator to Bonnie; a comb thieving blue polar bear; and curiously lifelike merry-go-round creatures. Although one line describes – Butterflies and Cockatoos/ Reds and Yellows/Greens and Blues – McKean’s attempt at my favourite Australian birds look more like parrots. I guess that’s the problem with living on the other side of the world. What I admire most about Gaiman & McKean’s approach to children’s literature is their refusal to condescend to young readers. It’s something that can so easily scuttle a story, as if kids are unable to tell when they are being lied to, or being force-fed an insipid tale of good triumphing over evil. These two creators do not pretend that there are not reasons to be afraid of the dark, but instead remind their readers that often it is more important to not spend one’s whole life running from shadows. In short, this is a magical fable that should be enjoyed by everyone. Pick it up.